Bedford Aerodrome is a licensed airfield owned and operated by MotorSport Vision Ltd (MSV). 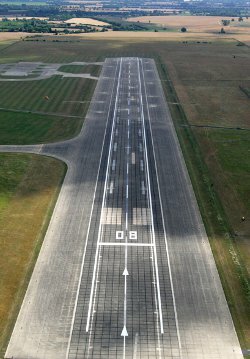 It is formed from the eastern 1100m of the original Royal Aeronautical Establishment (RAE) Bedford Ministry of Defence aerodrome, which featured a massive 2 mile long, 90m wide main runway. The remaining western end of the original runway is now used for intensive car storage and is not owned by MSV. Bedford Aerodrome mainly serves visitors to the adjacent Bedford Autodrome motorsport circuit, but is available to other users on request. With approximately 1000m of usable runway, it is capable of accommodating Public Transport flights up to King Air B200, and light jets operated privately, subject to the pilot's discretion. Visitors will normally be provided with a handling service and VIP shuttle to and from the Bedford Autodrome circuit complex. Accurate information regarding updated landing and departure times is therefore important. Bedford Aerodrome is located in a very noise sensitive area, so it is imperative that the Noise Abatement Procedures are fully understood and complied with. All arrivals must be on runway 08 and departures on runway 26 unless wind prevents this. Bedford Aerodrome is a CAA licensed airfield though normally operates unlicenced unless specifically requested and approved. Please note that road access to Bedford Aerodrome is not straightforward and must be co-ordinated with MSV. In general visitors by road will approach to the Bedford Autodrome main office, and then be escorted to the apron areas via the motorsport circuits, which may be active. The airfield can also be accessed by the southern perimeter road, subject to prior arrangement with MSV.